Posted on March 19, 2019 . Henrico County has appointed Alec W. Oughton to serve as chief of the Division of Fire, effective immediately. Oughton joined the division in 1999 and served most recently as its deputy fire chief for operations. He has been acting chief since December, when Anthony E. McDowell was promoted to deputy county manager for public safety. McDowell had served as chief since 2012. 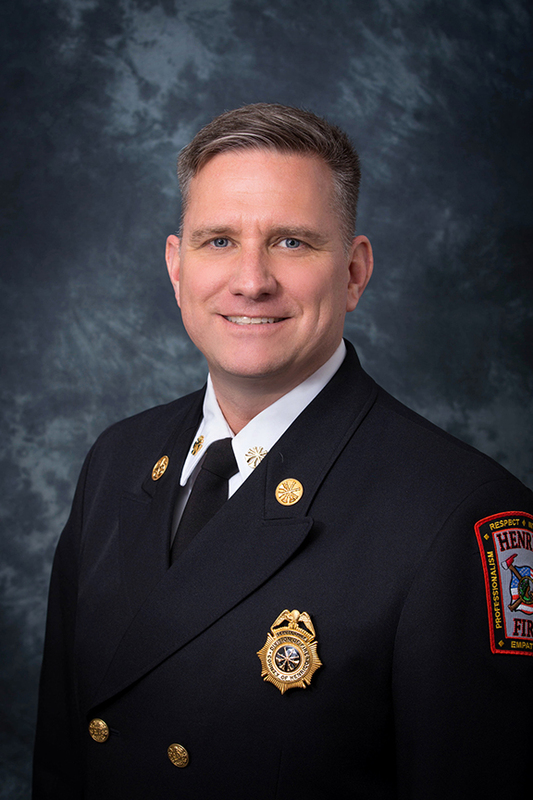 As chief, Oughton will oversee an agency responsible for fire prevention and suppression, emergency medical services (EMS), technical rescue, hazardous materials mitigation and disaster preparedness in Henrico. Fire has an approved budget of $61.5 million and 595 employees in fiscal year 2018-19. The division responds to more than 52,000 calls for service each year and operates 21 firehouses, with two additional stations planned, along Staples Mill and East Nine Mile roads. Henrico holds the highest-possible Class 1 rating from the Insurance Services Office, which is based on a comprehensive review of the county’s fire response, including its fire department capabilities and training. Oughton began his fire service as a volunteer with the Virginia Tech Rescue Squad and the Manassas Park Volunteer Fire Department before taking a staff position with Spotsylvania County Fire, Rescue and Emergency Management in 1996. He joined Henrico Fire in 1999 as firefighter/paramedic and held station operations leadership positions before transitioning into administration in 2014. Oughton served in 2018 as chairman of the Central Virginia Operations Chiefs subcommittee, which is part of the Central Virginia Fire Chiefs Association. He holds associate degrees in fire science and emergency medical services from J. Sargeant Reynolds Community College and a bachelor’s degree in interdisciplinary studies from Liberty University. He is scheduled to graduate in August from the Executive Fire Officer Program at the National Fire Academy.